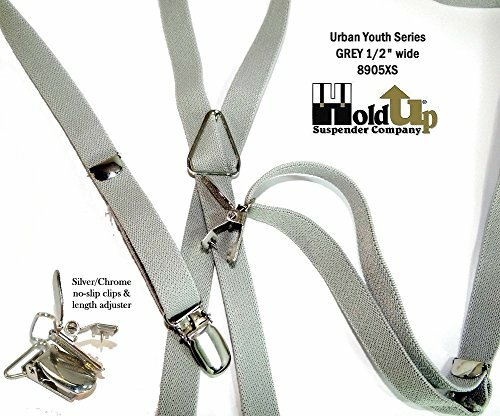 These thin 1/2" wide Urban Youth Series suspenders from Hold-Up® provide the latest fashion trend. These come in the X-back style. The narrow width and variety of colors are stylish and stand out in a crowd. These feature our patented "NO-SLIP"® silver clip. These are TOTALLY UNIQUE and teens love em! These suspenders are made shorter and narrower at 1/2" wide and 42" long for a trendy fashion statement. Dressing up with these is an inexpensive way to set off any type outfit with a unique look. For years our customer base included women and the shorter teenagers who wanted suspenders made just for them. Now they have the Urban Youth Series clip-on suspenders with clips and elastic straps that hold up year after year. Runway models worldwide are sporting our patented clip-on thin/skinny suspenders in all types of creative ways. Wear them with jeans, dress pants, shorts and skirts. These suspenders have metal wire crossback in an X-back style.